Here's my card for the Less is More Challenge week 118 - it's a colour week and you have to choose TWO opposite colours from the colour wheel. I did red and green last week, so went for Blue and Orange this time. I swiped Spiced Marmalade and a bit of Mustard Seed on the craft sheet, spritzed with Citrus Orange Ink in a Bottle and mopped up with some card. I stamped Oak House Studio's Sunflower on this with Jet Black Archival and cut out. It's mounted on some bright blue patterned card - I found loads of DCWV matstacks in TK Maxx yesterday so bought some textured card and this called Royal Garden which was all peacocks and peacock colours. 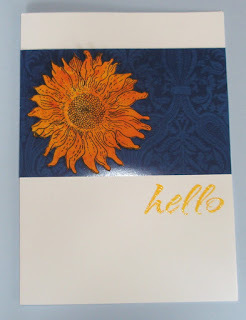 My card is just finished with the Darkroom Door sentiment stamped with Marigold Versacolor and clear embossed. Hope you're all having a gorgeous weekend - we're hacking down the shrubs and tidying the garden. Roll on summer!! This is really striking Elaine! Love the colour combination, great C&S card. Beautifully done, Elaine! LOVE that big sunflower....and the color combo is perfect!